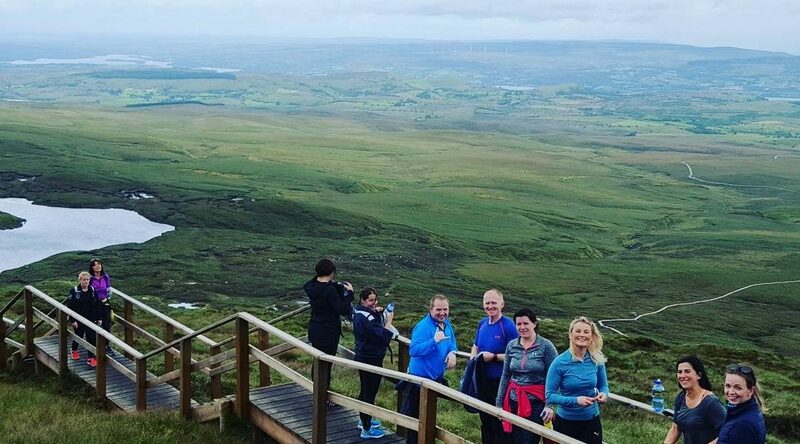 Unless you have been living under a rock this year, you will undoubtedly have heard of the Cuilcagh Boardwalk in Co Fermanagh. Nicknamed the ‘Stairway To Heaven’ it had become one of the most visited tourist attractions in Ireland this year. Contrary to popular belief, the trail is still open to the public. The number of visitors got so great this year, that the landowner closed off the carpark due to the volume of traffic and the inability of the carpark to cope. But you can now park in the Marble Arch Caves carpark which is just under a km away from the walk. The boardwalk, which cost over £250,000 stretches over 1.5Kms to the top of Co. Fermanagh’s highest point – Cuilcagh Mountain. Its popularity grew this year due to several videos that circulated on social media which showcased the beauty of the views and the ingenuity of the boardwalk itself. The ‘Stairway to Heaven’ tag came after an article in the Irish Independent which showed the walk in all its glory. Last weekend we took 33 of the Rushe Fitness members up to see what all the fuss was about. It takes around two hours in a bus, so around an hour and 45 mins by car should leave you at the carpark. The first thing you should know about the walk, and something that we did not, is that there is a 3.75km walk up to the boardwalk. This is quite hilly and if you aren’t very active, expect it to be a bit tough on your legs. It is rated as ‘difficult’ in the mountain walk guides, so be prepared for a good hike whenever you get there. You will cross 5 fences on the road up to the boardwalk, which has stiles to the side of them for ease of access. While the walk is a bit tough, once you reach the boardwalk it is all worth it. The boardwalk is a great piece of construction and is just under 2km long in total. When you are halfway up the boardwalk you get to an area that is exposed to the wind that blows down the valley, so be prepared for a gust or two that could send you off balance. Once you pass this, It is a steady climb all the way to the stairs. There are 450 steps which stretch over 36 flights of stairs in total. Some of the flights are quite steep and you will have to use the handrail on the way up for safety. All the steps and the boardwalk also have chicken wire fixed to the boards, so there is no fear of slipping on the way up or down. When you reach the top, the views are fantastic and really live up to all the videos and pictures that you have seen. One thing that I should add, is that all the pictures are from the top of the boardwalk, which is also the end of it, and it literally ends. The top leads onto marsh land at the top of Cuilcagh Mountain, and if you want there is another short walk to the highest point, which is the same as Muckish at 666ft. The complete walk, from start to finish and a 20 min stop at the top for some refreshments, took 3 hours. This was allowing for all levels of fitness of the group and some of you may do it faster, but it is something that you should do, if you have the notion. > Weather conditions on Cuilcagh Mountain can be quick to change & inhospitable all year round making way finding difficult in poor visibility at any time of the year. > Equip yourself for walking in a mountainous area, waterproof clothing, boots, spare clothing, map, compass, first aid, food, drink etc.